MONTREAL—Justin Trudeau is telling his party that it needs to woo disaffected Conservatives to the Liberal fold in the 2015 election, setting the stage for a large, red-blue battle when the next campaign rolls around. Though he was speaking to a room filled with thousands of Liberals at their Montreal convention on Saturday, Trudeau aimed many of his words at an unexpected audience — Conservatives and their supporters. Trudeau’s conciliatory words in the Conservatives’ direction were the strongest sign yet that the Liberals aren’t looking just on the left for votes in 2015, but on the centre-right as well, among people who are disillusioned with Prime Minister Stephen Harper’s government. Apart from the obvious point that parties look to pick up support wherever they can, the emphasis of the Liberals in convention and Justin Trudeau in his speech (as quoted in Delacourt's report) was on wooing Tory votes. The chart below clarifies where the Liberals have been losing ground. The Conservative line incorporates the Reform/Canadian Alliance vote, as that is where votes departing the Mulroney/Campbell PCs mostly went in 1993 and beyond. For purposes of simplification, I have ignored the Greens and the BQ in the chart. 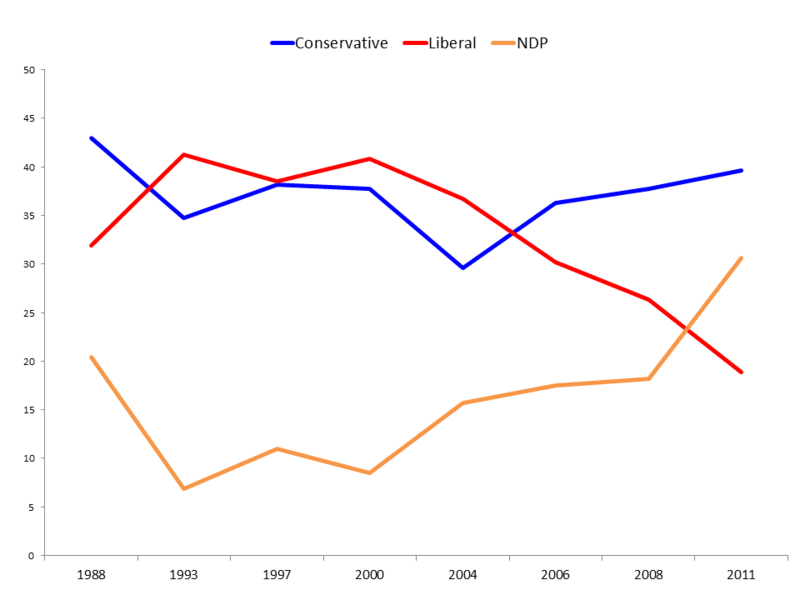 However, it should be noted that Green vote strength, which only showed up in 2004, likely came mostly from the NDP and the Liberals. The Liberals are doing well in the polls. However, even to win back Conservative seats in the Toronto suburbs (for example) one key for the Liberals would be to win over some NDP votes there. In 2011 the NDP won about 18% of the votes in the 905 belt around Toronto. My impression is that both the Liberal party strategists and the Ottawa media continue to underestimate the strength of the NDP. Canadian politics have many complexities and nuances that one ignores at one's peril. Can we have a non-partisan Senate?